Unique Computer Systems (a Unique Maritime Group Company), is a leading local software solutions and services provider and is happy to announce its presences once again in Gitex Technology Week 2012, slated to run from 14th to 18th October 2012 in Dubai, United Arab Emirates (UAE). This year, Unique Computer Systems, has been invited by Etisalat to present its field sales solution, SalesWorx, alongside Etisalat on its stand in Zabeel Hall. 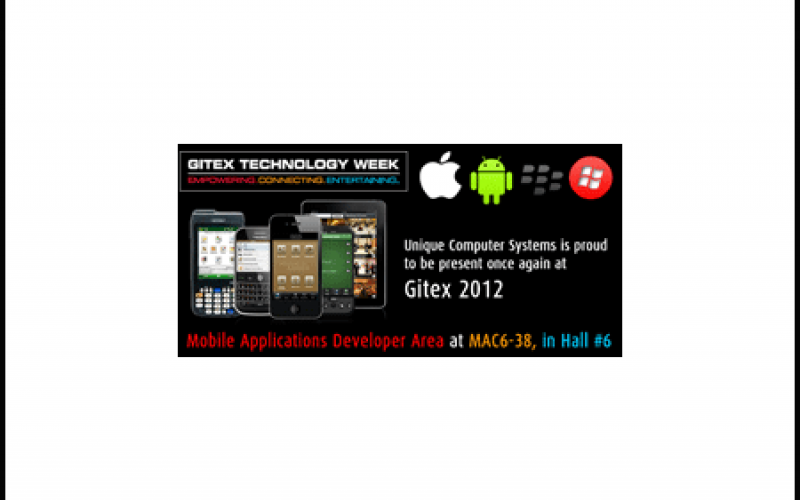 Unique Computer Systems will also be presenting its mobile solutions in the Mobile Applications Developer area at its stand MAC6-38 in hall number 6. UCS plans to demonstrate the latest IPad versions of its mobile business applications for Pharmaceutical Sample Management, PharmaWorx as well as its leading field sales management solution, SalesWorx. In addition, UCS will demonstrate other cross-platform applications development for the pharmaceutical, hospitality and retail industries. We will also be demonstrating our popular SMS server, Reson8, for hosted and enterprise text messaging solutions. Manish Bhatia, Chief Technical Officer at UCS said “Mobility has been a hot topic this year, and UCS is a leading mobile development and solutions company. We are anticipating lot of interest in our Enterprise (B2B) and Consumer (B2C) mobile applications”. “Our aim is to highlight the quality of locally developed business solutions and cross-platform mobile applications” he added. Our products are designed and developed locally to meet the requirements and business processes of regional customers. We deliver creative solutions in shorter time periods. Being a UAE based company, we offer highly responsive service and are able to address customers’ requirements faster. Over the years, UCS has found GITEX to be an important part of the events circuit that offers a good opportunity for local, innovative businesses the platform to demonstrate their skills and products. We also look forward to meeting new prospective clients and partners. GITEX draws a lot of regional and international attention and presenting at such event provides increased exposure for our products and services. Gitex event offers a great venue for us to meet key business decision makers and continue to build relationships with potential customers partners and enhance their overall success.